We welcome questions and queries about our work. 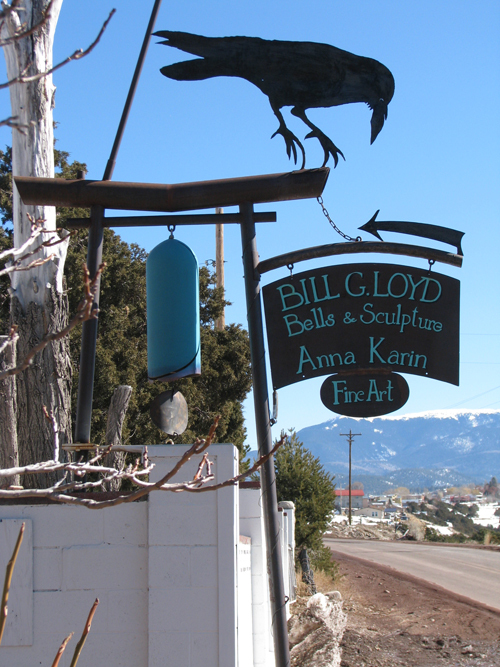 Our studios [see, also, AnnaKarinGallery.com] are located in the picturesque and historic village of Truchas, nestled along the west base of New Mexico's second highest mountain. The village is on the "High Road" between Pojoaque and Taos, approximately an hour's drive from either Santa Fe or Taos. From Santa Fe, take St. Francis Dr. [US 84/285] North to NM503 and turn right. You will travel through the Nambe River Valley and then to the "out-back" of rolling hills and sandstone formations. At around 7 miles turn left onto CR 98 [Juan Medina Rd.] Drop down into the village of Chimayo. About 1/2 mile after passing the Santuario de Chimayo, turn right on NM 76, which will bring you to Truchas. The driveway to our studios will be on the left just before you enter the village. From Taos, take NM 68 South to Ranchos de Taos and turn left on NM 518. Enjoy the beautiful alpine vistas. Before you reach Sipapu ski area, turn right on NM 75. Travel through Penasco and turn left at NM 76, just before Picuris Pueblo. Pass through several rustic mountain villages to Truchas. Turn right. Travel 3 blocks, our sign and driveway to our studios are on the right.